We’ve explored several tools on previous tutorials, which allow you to protect your browsing data from others through the use of VPNs. They help us by allowing all traffic to be rerouted somewhere else; therefore all traffic we generate will look as if coming from another location, wherever our VPN server is located at. Now, we’re going to take a different approach. In this tutorial we will discuss how we can use automated tools that generate random traffic from our host computer. For this, we will look at Noisy. 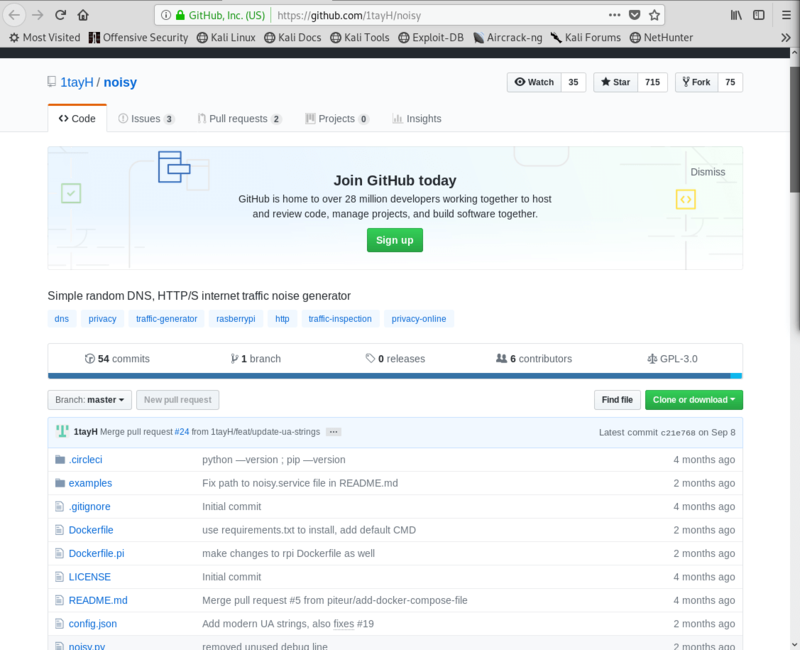 A Python script created by Github user 1tayH, that generates random HTTP(S) and DNS noise traffic in the background while you browse the web; therefore providing extra obscurity from anyone looking for browsing patterns. Before we begin installing the script, we need to verify whether we have the correct version of Python installed on our system. As you can see in the screenshot below, as long as we have either Python 2.7 or 3.6, we’ll be good to go. You can use the python -V, python2 -V, or python3 -V commands to verify the versions of Python that are installed in your computer. As you can see, we already have both versions of Python. Namely 2.7 and 3.6, which means that we’re ready to continue. Following the installation of dependencies, we’re ready to download the script by using the git clone command. 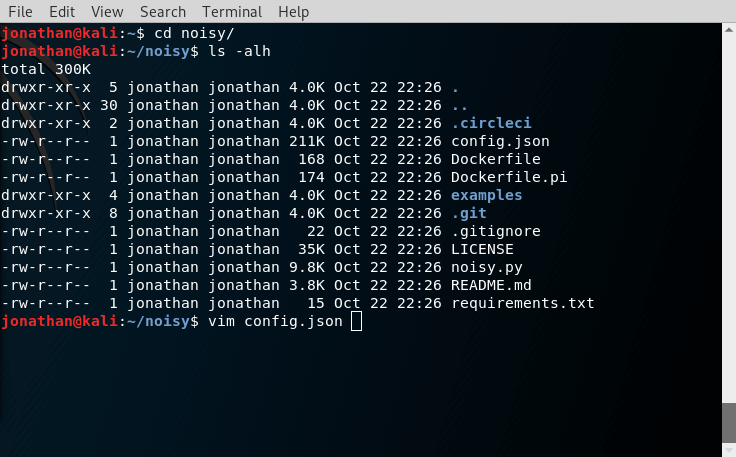 In order to understand how Noisy works, we can open the config.json file with a text editor. We’re mainly interested in the contents of the root_urls parameter, which contains a list of the websites to which Noisy will be making requests. As we can see, the default list is quite small. We can make it better by adding more websites to it. 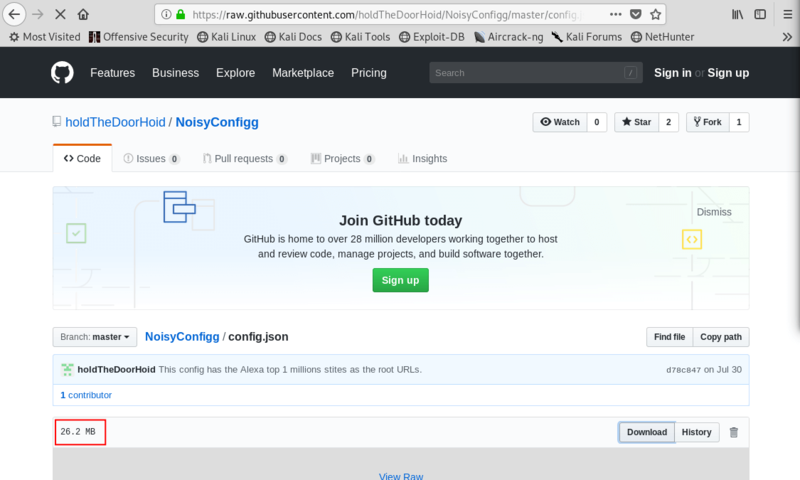 Thankfully, Github user holdTheDoorHold has compiled a quite large list of websites that can be used, and set them up in config.json file that we can download from the NoisyConfigg repository. You’ll notice the file is 26 MB in size. If we click on the View Raw link, we can see its contents, similarly to the screenshot below. From here, we can go ahead and create a backup of the original configuration file. Next, we need to download the new configuration file into the appropriate directory. For this example, it is under the noisy folder in the home directory of the currently logged-in user. To run Noisy, enter the following command. Remember that Noisy is a Python script, which is why we need to call the Python interpreter first. The –config flag tells Noisy to use the config.json configuration file, which is given as a parameter. 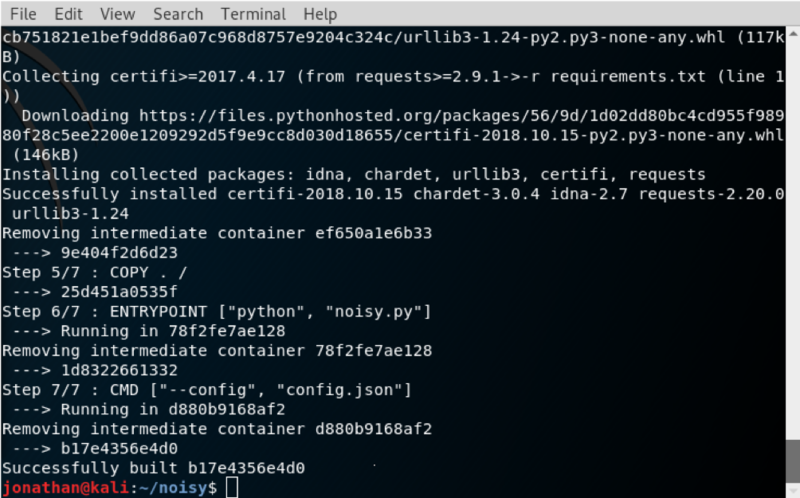 Once we run the command, we can see that Noisy is automatically generating requests to the websites listed in the configuration file. To stop execution of Noisy, press Ctrl+C at any time. You can view the Help options by using the –help flag. 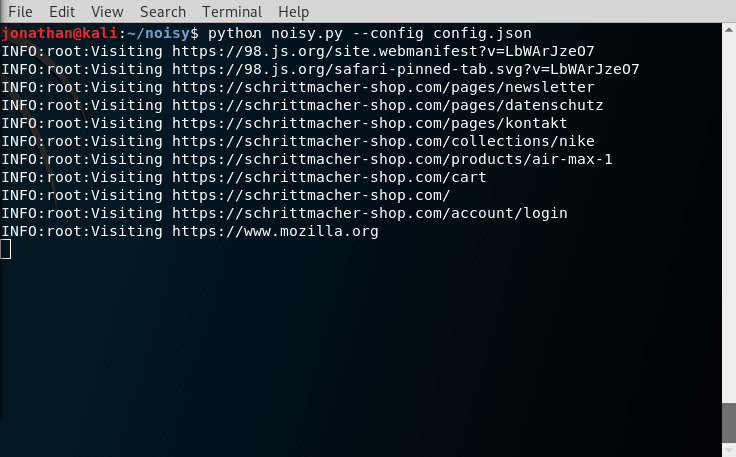 From what we’ve done, you can see that Noisy is a really simple way to create diversions in order to mislead anyone who might be spying on our traffic; in attempts to generate a profile, based upon our browsing habits. One important thing to note is that Noisy will generate a new request every second. This is relatively good for most uses. However, we can do much better than that, by spinning up a few docker containers, which would allow us to generate even more requests per second. That way, anyone inspecting the network packets for our device will have a much harder time defining any potential browsing patterns from the data they collect. We will look into how to do that in the next section. Next, we need to check the status of the docker service, starting and enabling it if needed. 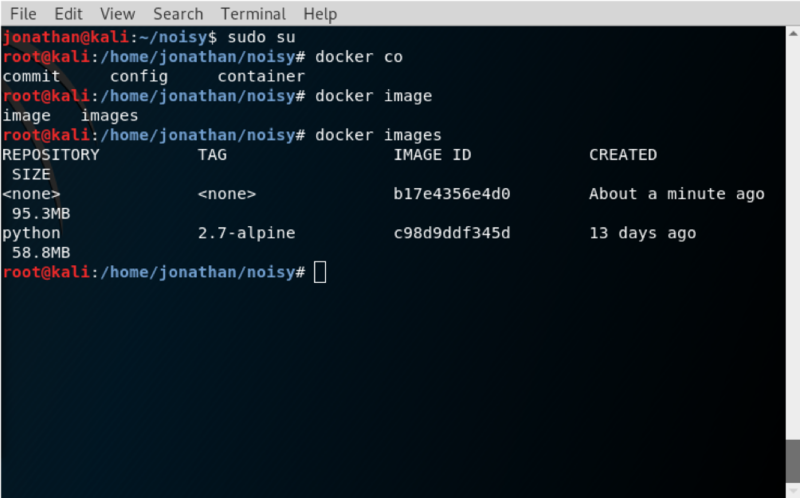 Once docker is running, we can check the current working directory for Noisy, where we will find a Dockerfile that we can use to build a Docker container, like so. Remember that you need to build docker images as root! If you don’t you’ll likely see this error message. If you’re not logged in as root, you can enter the sudo command as a prefix to docker. From the second screenshot, you’ll see that the Docker image was built successfully. We can now run the docker images command, as root, to get a list of currently available images. 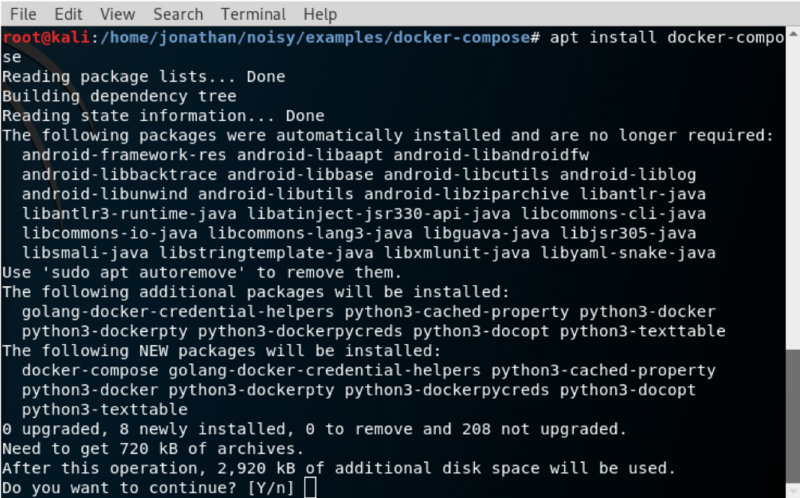 Following the requirements for Noisy, we now need to install the docker-compose package, as it’s needed to run the containers for Noisy properly. 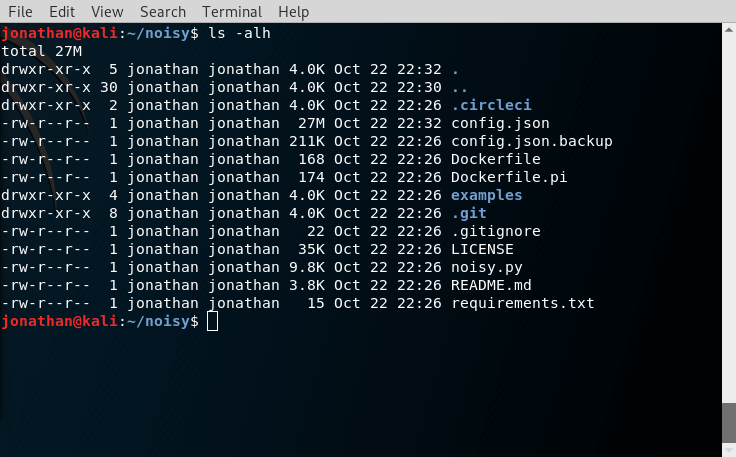 Once installed, we can go into the examples/docker-compose/ directory inside the noisy/ folder. 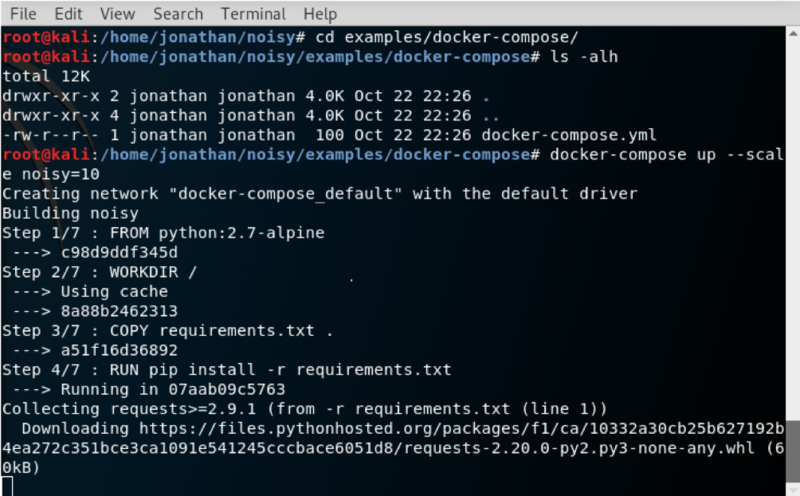 Here we’ll find the docker-compose.yml file, which will help us run our Noisy instances. 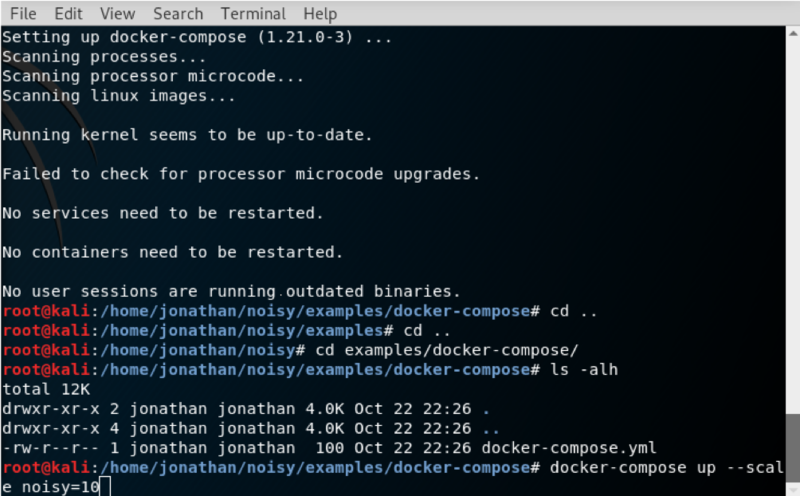 From here, we can run the docker-compose up –scale noisy=10 command. The up parameter tells docker-compose to run the container image. The –scale flag with the noisy=10 parameter tells Noisy to use 10 instances, therefore allowing us to generate 10 requests per second. 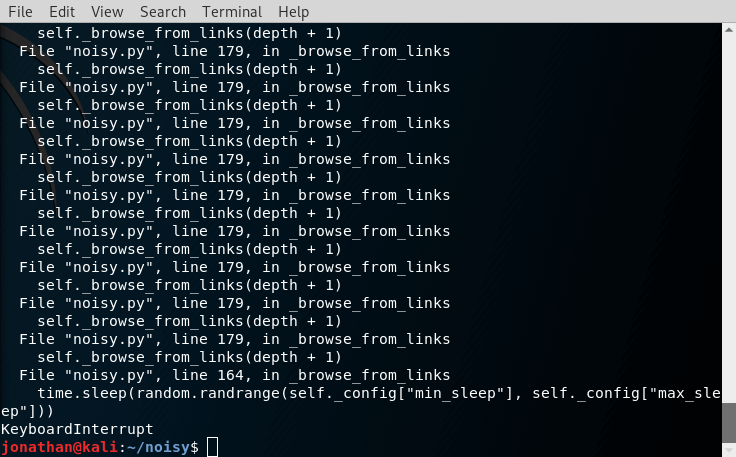 You will then see that each of our containers will be named as noisy_N, where N is the index of each of the 10 containers we created for this example. Remember, of course, that you can run as many or as few containers as you want, as long as your computer has the processing capabilities to sustain such loads. If we run a packet inspection utility, such as Wireshark, we will notice that there are hundreds, even thousands, of requests being generated by Noisy. On the following 2 screenshots, take a close look at the Time column. You’ll notice that, in just under 80 seconds, Wireshark has already detected close to 15,000 packets transiting outside and inside our computer; with our host having the 192.168.10.105 IP address. Finally, if you want to stop all of your Noisy containers, you just need to go to the terminal window where you started them, and press Ctrl+C, like so. It may, however, take a bit until all containers are fully stopped. Welcome back my fellow hackers! 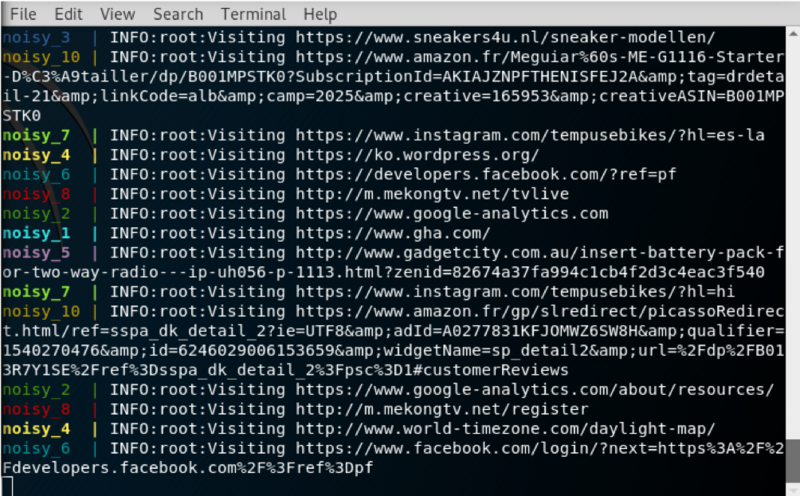 We’ve covered host discovery tactics before; specifically, we’ve covered ping scans and ARP scans. But we didn’t go very in-depth when we covered ARP scans. Today we’re going to dive head first into this enumeration tactic by building our own ARP sniffer! 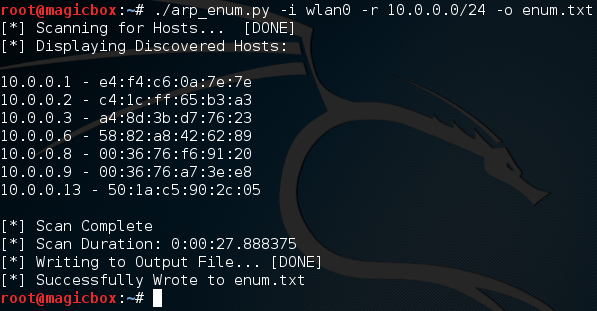 This tool will use ARP to find other hosts on the network, that way we know who our neighbors are. We’ll be writing this tool in Python, so brush on that if you haven’t already. We’ll also be using the Scapy library for manipulating the packets. We’ve already covered the basic usage of Scapy, so if you don’t know (or just need a refresher) you can find it here. First we’ll go through the script chunk by chunk and explain what everything does, then we’ll test our script to make sure it works. So, let’s get started! Now this actually looks way more complicated than it is. We start by setting our interpreter path (#! /usr/bin/python), and then we get to importing modules. First we take the entire sys module, then we take datetime out of datetime. Now here’s the weird part. Since Scapy is a third party library, not everyone will have it installed on their machine, so we need to take that into consideration when building our script. Instead of import Scapy directly, we place it within a try/except block, so that if the import fails (since it isn’t installed) there aren’t errors spilled everywhere. This keeps everything nice and tidy. Within the try/except block we import getLogger and ERROR out of the logging module. We then run the getLogger function as seen above. This will stop Scapy from spilling out its own errors when we import it. We then import everything from Scapy, and set the conf.verb to zero. This will stop Scapy from throwing out messages that packets and been sent and received, which also helps keep things clean. Now that we have all our importing done, we can get to the fun stuff! We’ve named our class ArpEnumerator. Next, we define our __init__ function. This function will automatically run when a new instance of this class is made. This is where we can set up variables that will be used throughout the entire class. We’ve taken quite a few arguments in our __init__ function, don’t worry about these for now, just note that the default value for all of them is False. Now we can set up the variables for our class. We start by simply copying all our arguments into variables that share the same name. Now we can access these arguments across the whole class. Next, we declare a dictionary, but we leave it empty. We will use this to keep track of the hosts we find later. The filter variable is simply set to the string of “arp.” This is a good time to mention that this script will also have a passive mode, in which it doesn’t sent any packets, but still listens for them. This filter will change later to fit the needs of the user. Our final variable is simply the value of the datetime.now function. This will allow us to track when the enumeration starts and stops, so we can tell the user how long it took. Now that we have all our variables set up and ready to rock, let’s move on. The function seen above will actually perform the sniffing. We start by checking the range variable we set earlier to see if it contains anything. If it does contain something, we edit the filter variable and add the desired range of addresses to it. This way the attacker can sniff for a specific range of addresses, or all the addresses at once. Now that we have our filter ready to go, we call the sniff function inside of a try/except block. We set our filter, and our handler function. We also set store to zero, since we won’t be inspecting these packets any further. This functions gets a little more complicated than the others. First, we tell the user that we’re beginning the scan. Then, we use the srp function from Scapy to send out ARP requests for all the hosts in the range of addresses provided by the user. Once we’ve gathered all the response packets, we store them in the ans variable (note that we’ve also built a try/except block to handle any errors that occur). Now that we have all our response packets stored in a list, we iterate through them and store them in our dictionary of discovered hosts. We also print out the addresses of the host while we store them. Once this iteration is complete we tell the user the scan is done and stop the clock for the scan duration. This function simply opens a new file (named by the user) and writes the contents of the discovered hosts dictionary to it. This way the user can output the results to file very easily! Now that we have our class and functions ready to go, let’s use them! That does it, our script is complete! Now that we’ve spent so long building it, we can finally test it! It works! It’s worth noting that passive sniffing will normally take a rather long time. I had mine running for a few minutes and only managed to catch two hosts. The perks of passive sniffing is that no packets are sent out, so the victim has no way to tell that they’re being watched! This helps us prevent tripping security devices such as an intrusion detection system, which can be set off by sending too many packets at once. There we have it! Our script works like charm. Now that we’ve got our hands dirty and built our very own ARP enumerator, we should have a much deeper understanding about how ARP enumeration works. Remember: The best way to learn how something works, is to tear it apart and build it yourself! Welcome back my fellow hackers! There have been some articles I’ve been wanting to write regarding social engineering, more specifically, stealing passwords. But, in order to do that, there are some basic concepts and methods we needs to have a grasp of. The first of these concepts is Man in the Middle Attacks. Since we’ve already covered that, we’re going to cover the next concept, DNS spoofing. First, we’ll cover what DNS is exactly, then we’ll quickly discuss the anatomy of the DNS spoofing attack, and finally, we’ll perform the attack! So, let’s get started! This question is actually fairly simple. DNS stands for Domain Name System. You know when you go to a website using a browser, you type in a URL instead of the IP address of the server? That’s DNS working it’s magic! What DNS does is it keeps track of what IP addresses reside at what URLs, that way we don’t have to remember the addresses, just the URLs! Pretty neat, huh? 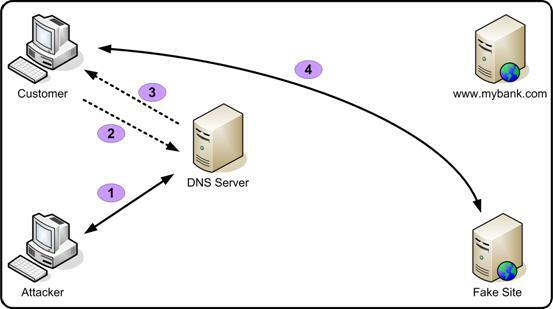 Like I said, DNS is fairly simple, so let’s move on to the next part, the anatomy of a DNS spoofing attack. As we can see here, the attacker starts by pretending to be the DNS server. Then, when the victim requests the address for the desired site, the fake server responds with whatever address the attacker wants, which in this case, directs the victim to a fake site. This attack is very simple, but can often play a part in a larger attack. Now that we know the ins and outs of DNS spoofing, let’s perform it ourselves! Before we really get started, there are a couple of things that we need to prepare. Namely, we need to prepare the fake website, and set up the configuration file for the DNS spoofing tool. Feel free to replace the words with whatever you like, as long as you follow the HTML tags, everything should be fine. The line we added (the bottom one), will tell the spoofing tool that we want www.hackingloops.com to be redirected to our local IP address, which will then serve them our website instead of the real one! That’s it for the setting up, now it’s time to execute the attack! 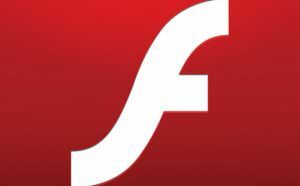 Once we execute this, the MitM will start. There we have it! 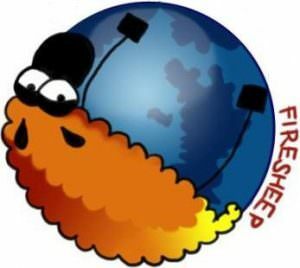 We were able to start a Man in the Middle attack, and use it to perform a DNS spoofing attack, which redirected a legitimate request for www.hackingloops.com to our fake website! There are multiple reasons for this article. For one, we’ll be needing these attacks very soon in order to steal passwords from an unsuspecting user. Secondly, it’s a proof of concept of sorts. 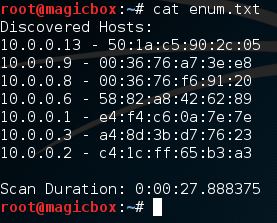 It shows that these smaller attacks (MitM, DNS spoofing, etc.) aren’t just one trick ponies. We can combine these attacks to achieve even greater things. Many times, when performing an actual hack, you will need to combine many different kinds of attacks at once to achieve a goal, this just proves that. I’ll see you next time!